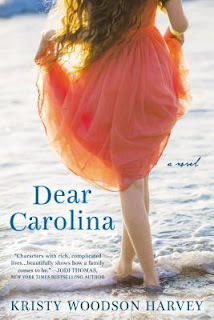 Jodi Thomas says on the cover - "Characters with rich, complicated lives.... Beautifully shows how a family comes to be". As Jodi Thomas is a favourite author of mine, I needed no further incentive to read. Each chapter is alternately spoken by two women. It is addressed to baby Carolina, and while that sounds a little odd it works perfectly. Frances Mason - Khaki to those closest to her, is a very successful interior designer, mother of Alex and wife of Graham. They live mostly on a farm in Nth Carolina, but they also have an apartment in New York. Khaki has it all and is very happy, but the one thing she would love is another child to add to their family. Jodi is a cousin of Geoffrey and while he has had a well adjusted life, Jodi has not been so lucky with an alcoholic mother and a father who died. Jodi also reaches for the bottle when things become stressful. So when she is pregnant at nineteen, she fears that her baby is going to end up having the same kind of life as she has had, and she doesn't want that. With an aching heart Jodi comes to a decision that she hopes will give Carolina the love and sense of family she wants for her. Khaki has a huge loving heart, and as the story progresses she makes decisions that are right for her and her family, so by the end she is very grounded. Jodi - so young, has a wonderful sense of planting and growing and is an expert in canning and jam making. She knows if she can keep busy she may have a chance of overcoming the need to drink. She too has a big heart and I enjoyed her evolution during the span of the novel. I really enjoyed this book, I think anyone who enjoys women's fiction, and the exploration of parenthood, love, trust and strength and growth will find it right down their alley. It's hard to believe this is a debut novel, it's so accomplished, totally agree with Jodi Thomas! This sounds wonderful! Thanks for your great review. I'm going to add this to my 'To Read' list. Kathryn this sounds amazing and woot for your New Zealand library to stock it!! It's great how that happens! As it's a debut book I just found it amazing that someone was aware of it. I guess publishers do a lot of PR. This may be a read I might enjoy. I love it when the library hooks one up with a great book. This one does sound like my kind of book, too, and I have yet to read this author. So thanks for sharing! Yes think you would like it Laurel-Rain. This does sounds really good, and I like the alternating perspectives. So happy you found a copy at your library. Libraries are cool. This one sounds different and the premise pulls me in. The alternate voice style sometimes works for me and here it seems that it did for you, so I think I'll check my library for it :) Thanks.